One More Reason I Love Texas. . . . . . . ."Great, Speckled Bird"
It’s 1975, in a small West Texas town. The Band Director of the high school announces to the band and the baton twirlers that he has arranged and choreographed the 1936 Roy Acuff gospel song “Great Speckled Bird” for them to perform. I’ve got to believe that no similar announcement was ever made by another Band Director, anywhere. Don’t read any further, though, without listening to the song first. 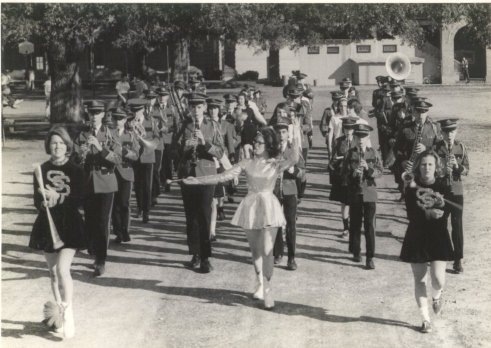 Then try to imagine the embarrassed horror of being a 15 or 16 year old member of the band or twirling squad and having to perform this song, with appropriate choreography, on the football fields of other towns, in front of other 15 and 16 year olds, at halftime. As I’ve heard the story, the performers marched, twirled, and cringed, all at the same time. On the pages of God’s Holy Word. And has not denied Jesus’ name. From Baptist Singing Conventions in the 30s, to the Grand Old Opry in the 50s, to football fields in Petrolia, Chico, and Alvord in the 70s, the Great Speckled Bird was both a testimony to Jesus and a psychological trauma for many Texas teens. Where else could a song achieve such a legacy? Oh Texas, how do I love thee? Let me count the ways..